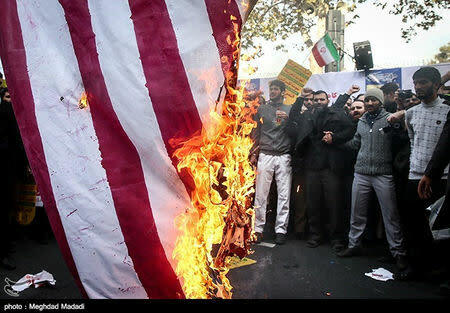 Students attending the government-organized rally in the capital Tehran, broadcast live by state television, burned the Stars and Stripes, an effigy of Uncle Sam and pictures of President Donald Trump outside the former embassy compound. Rallies are staged on the embassy takeover anniversary every year. But rancor is especially strong this time following Trump's decision in May to withdraw from world powers' 2015 nuclear deal with Iran and reimpose sanctions on Tehran. Trump said the deal was weak and favored Iran. The other signatories - Britain, France, Germany, Russia and China - remain committed to the accord. U.S. Secretary of State Mike Pompeo said the penalties set to return on Monday "are the toughest sanctions ever put in place on the Islamic Republic of Iran." Interviewed on "Fox News Sunday," Pompeo said, "There's a handful of places where countries already have made significant reductions in their crude oil exports and need a little more time to get to zero. And we're going to provide that to them." He did not elaborate. The Iranian military said it would launch two days of air defense drills on Monday and assured Iranians that it could neutralize any threats, the state news agency IRNA reported. "It's black humor, but the audience can also be brought to reflect on the contradictions in the behavior of Trump and (the royal house of) Al Saud," artist Masoud Shojaei Tabatabai told state television in Tehran. The restoration of U.S. sanctions on Monday targeting Iran's oil sales and banking sector is part of an effort by Trump to force Iran to halt its nuclear and ballistic missile programs outright, as well as its support for proxy forces in conflicts across the Middle East.